Scuderia Ferrari Club Andalucia. Signing-up. Join us now and you would be abble to participate in our events! Account Number: 0049 2189 73 2114038936. Beneficiary: Scuderia Ferrari Club Andalucía. Concept : Your Surname and Name. 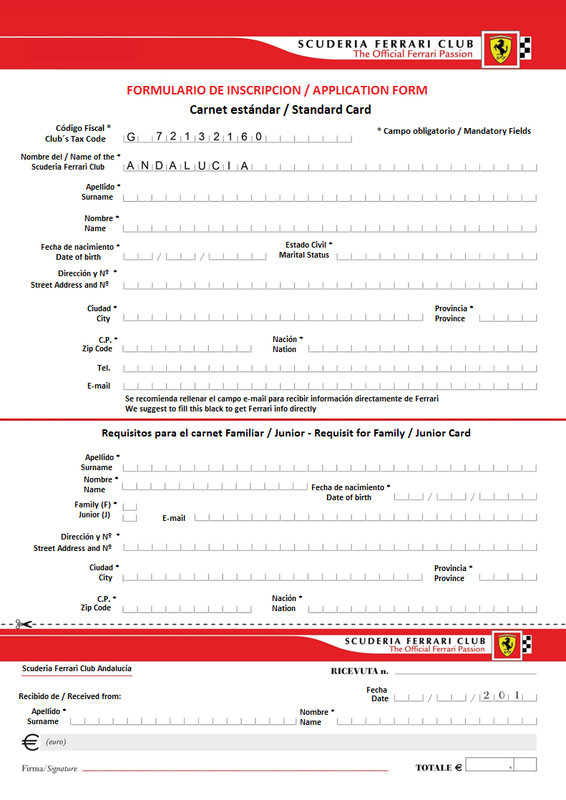 And that´s all, you are now a Scuderia Ferrari Club Andalucia member with all your rights and benefits. For your welcome kit you will have to wait a máximum of 120 days in order to collect it. Membership Suscription: 40 eur year. Junior Membership ( 1-14 years) = 20 eur year. Family Membership = 20 eur year (another family membership it´s required). Download the file. SFCA Membership Benefits.